From the 16th century onwards artists paid increasingly greater attention to the myth of Venus, converting it into a vehicle for praising female beauty and powers of seduction. 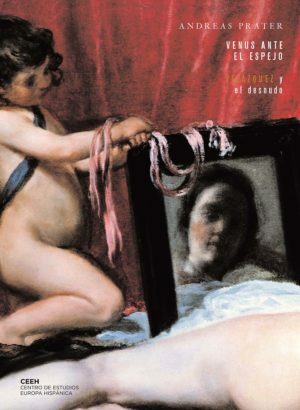 In his book Andreas Prater reveals the immensely rich variety of themes and implications—aesthetic, moral and even political—of Velázquez’s Venus, showing the iconographic precedents that make possible the interpretation of this fascinating and much-debated painting whose modern vicissitudes include an attack suffered in 1919 at the hands of an infuriated suffragette. Born in Teisendorf (Bavaria) in 1945, Andreas Prater studied Art History, Classical Archaeology, Psychology and Philosophy at Munich and Salzburg Universities. After teaching at Braunschweig, Munich and Giessen universities, he was appointed head of the Art History department at the University of Freiberg im Breisgau. The breadth of his interests, which range from the great artists of the baroque to ornamentation and the study of emblems, has led him to study various aspects of the work of Altdorfer, Mantegna, Raphael, Cellini and Poussin, among others. Prominent among his extensive bibliography are Michelangelos Capella Medicea. Beobachtungen zur Architektur und zum Ornament (1974, his doctoral thesis), Cellinis Salzfaß für Franz I. Ein Tischgerät als Herrschaftszeichen (1988) and Licht und Farbe bei Caravaggio. Studien zur Ästhetik und Ikonologie des Helldunkels (1982, the post-doctoral thesis that qualified him for his university post). This is the first of his books to be translated into Spanish.